Shopping for and ultimately selecting a new knife as your constant companion can be a daunting task, not only for greenhorns but for seasoned outdoorsmen alike. Being your lifeline in the woods, it’s understandable that your knife be able to tackle to the widest possible array of tasks, while sacrificing the fewest number of desirable traits. Your blade must be honed, sturdy, and ergonomic in order to provide you with the greatest utility. When you’re shopping for a new blade either as a supplement or for light use, such as a small Gerber knife, White Mountain Knives has the selection and the availability to bring you what you need. Because there is so much you can ask of a knife, at White Mountain Knives, quality and selection rule the business. When you’re shopping for a small Gerber knife, you’ll be faced with an encyclopedia of choices, and of course, with Gerber’s storied history of dependability, quality is implicit. For those looking for a small and affordable fixed blade, something like Gerber’s Moment with a black rubber handle is hard to beat for simple dependability. Coming in at just under 9 inches overall with a 3 inch change blade, this full tanged model packs the unbeatable integrity of a fixed blade into a size more commonly encountered in folders for maximum leverage. For a small folder with classic lines and the integrity of a lockback, Gerber offers the LST with a glass filled nylon handle. With a 2.63 inch blade, 3.61 inches of closed length, and 420HC stainless steel for ease of care, this is the perfect little knife for everyday chores or as a supplement to a larger fixed companion blade. For a folder that is a little heftier, and boasting an ambidextrous thumb stud for one handed deployment, Gerber’s pocket square is the perfect little folder where near indestructibility is desired. 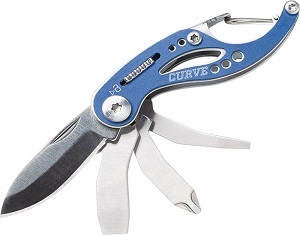 It offers a machined aluminum handle for jobs where abuse is imperative. Bringing compactness to an art form, Gerber also offers the GDC Money Clip knife, marrying the sturdiness of a fixed blade to the coyness of a folder. Bringing 1.7 inches of blade to the table, the knife also has an integral grip ring, a knurled choil and serrated jimping to ensure effective grip and ergonomics when you put your blade to the test. It’s hard to imagine a knife reseller as dependable as the timeless stock it carries, especially when that stock is Gerber, Buck, and Case. However, with White Mountain Knives you get just that. Their inventory is individually selected on merit and what’s even better is that U.S. orders ship free. White Mountain Knives also maintains a portfolio of other vendors, so on the chance that you’re looking for something that you just can’t seem to find, reaching out to White Mountain Knives may well just be the easy solution you need. When the time comes to invest in a new small Gerber knife, head to WhiteMountainKnives.com.